Recently I made them for my other children, I realized this is a recipe that should have (would have) been passed down to you, too. 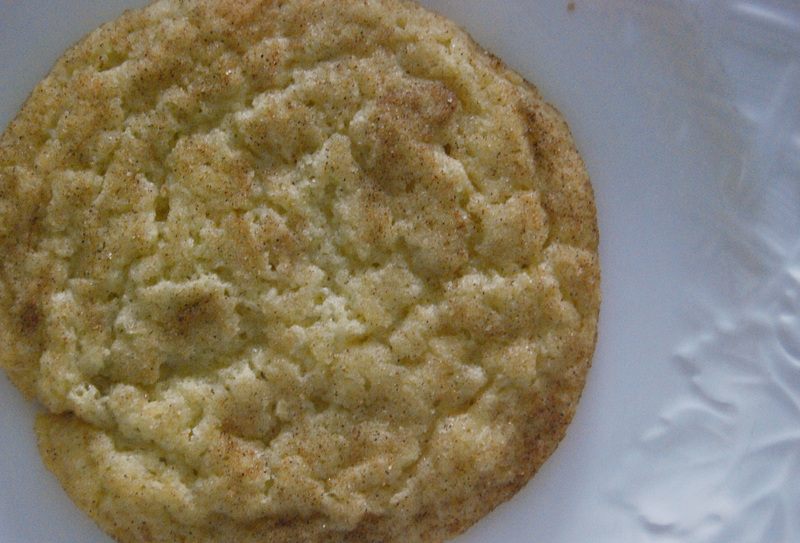 So here it is now, your invitation and passport into the sisterhood of the Snickerdoodle. I hope you enjoy them as much as we did growing up and as much as Captain Knuckle, The Professor, and Poppy do now. Bring all ingredients to room temp. Cream butter in large bowl. Add 3 c. sugar and then blend until light and fluffy. Add eggs one at a time to butter mixture, beating well after each addition. Blend again until light and fluffy, scraping down sides of bowl as needed. Sift dry ingredients together. 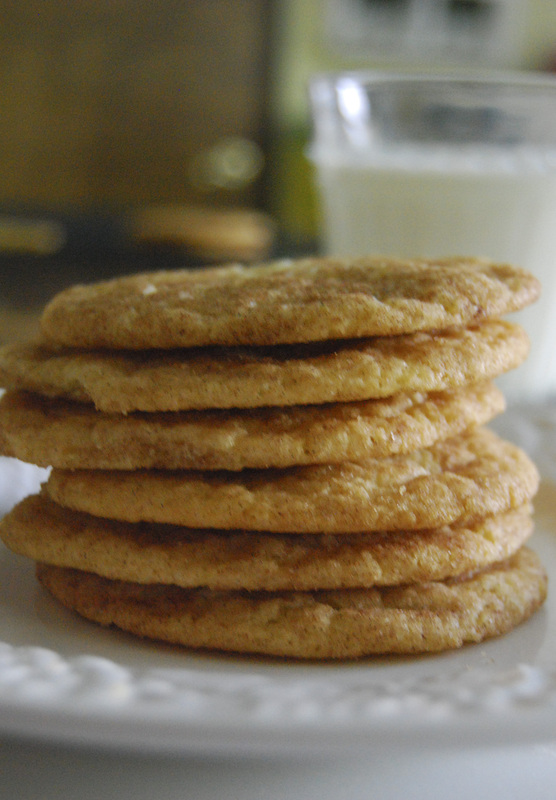 Blend into butter mixture, along with vanilla. Be sure not to over mix, as this will create a cake-like cookie. Dough should be fairly soft. Chill dough in fridge for 1 hour. Meanwhile, mix 1/2 c. sugar and cinnamon together in a small bowl. Scoop 1 Tbsp balls of dough into cinnamon sugar mixture, then roll around to coat thoroughly. Place on ungreased cookie sheet and bake for approximately 10 minutes. 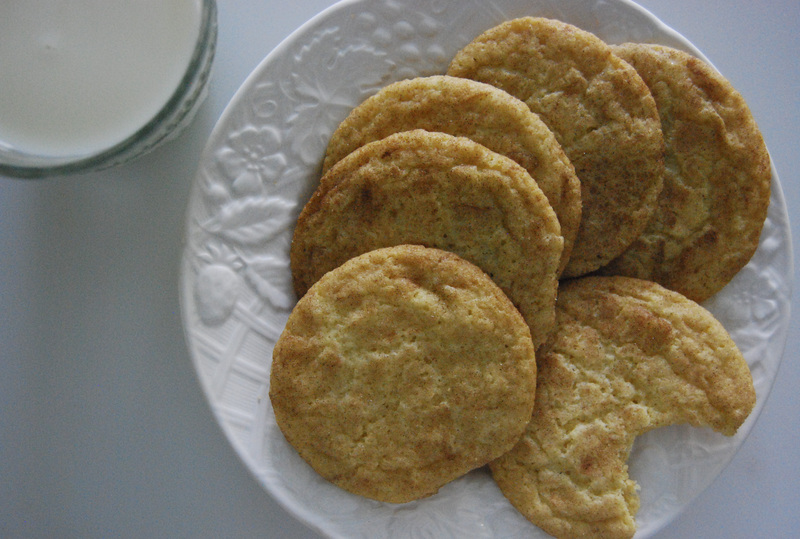 Remove cookies from pan as soon as they come out of the oven. I have a bunch of sisters. Five of them in fact. This is a story about one of them, Elly. 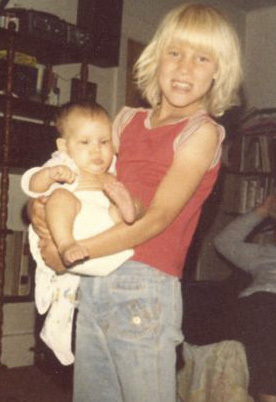 (She’s the adorable blond haired, blue eyed baby in my lap. 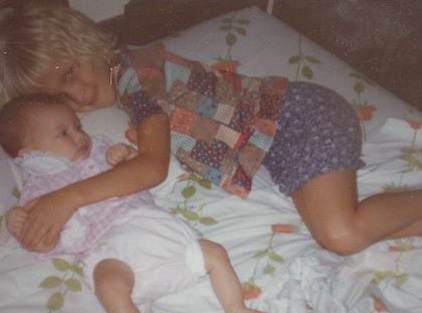 This picture was taken while we were living on Guam – I was about 5 and she was about six months old). I was the perfect age when she was born and simply adored “mommying” her – it was like having my own real-life baby doll. I loved playing with her. I loved holding her. I loved being with her. I loved it so much that I remember asking my mom if I could hold her and she would say, “Only after she wakes up from her nap.” So I would go wake her up from her nap so I could play with her. (Eeeeek! Sorry for doing that, ma. You must have wanted to ground me for the rest of my life, especially considering you had seven other kids and getting Elly down for a nap was probably your one of your only reprieves for the day). At any rate, Elly has started reading these letters (Hi Elly!). The other day she sent me this message on Facebook about the time period when she found her self a single expectant mother. So I guess some good came of all of this…of us. She has been a great mom to her wonderful C., now a 6 ft + tall strapping 14 year old football playing uber-smart genius. And in spite of this thorn plunged into my heart, I am grateful she was spared the peculiar agony that only a first mother knows. I hope that as I begin to share my story with other single expectant mothers they might come to the same conclusion to which Elly arrived: She was enough and that she would do whatever it took to raise her sweet baby. I am one of those kinds of mothers who feeds her family pie for breakfast, especially when we are leaving for a short vacation and there is homemade pumpkin pie leftover from dinner last night needing to be eaten. (In my defense, we all had scrambled eggs before eating the pie). Captain Knuckle started to correct him by saying that the girls won’t be having pie. I hushed him quickly and told him it was all right. Then I choked back salty tears and dished out the pie realizing that just like his older brother, this sweet 6-year old counts you as family – his tuafafine. I haven’t talked to him much about you since the chicken incident a week or two ago but clearly, he has been thinking about the fact he has an older sister out there. And he is very concerned that you get your piece of the homemade pumpkin pie. 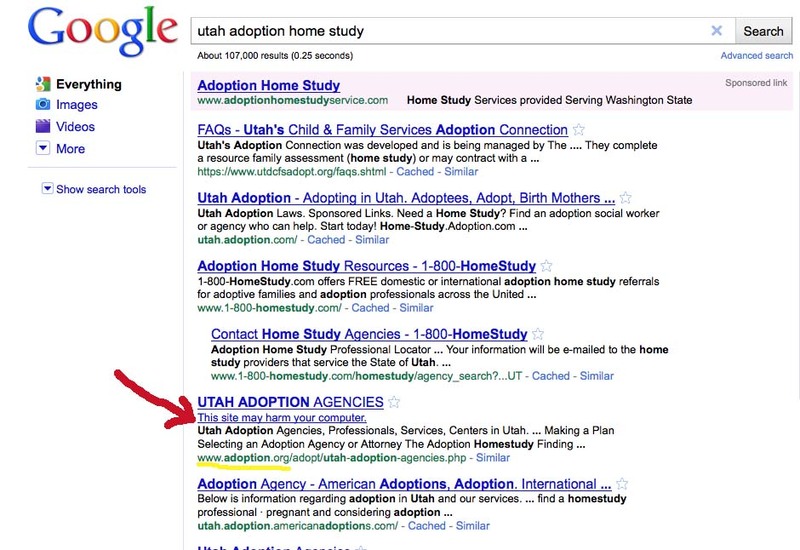 I got a good laugh when I saw that going to the site “www.adoption.org” may harm your computer. I thought, “Harm my computer? That’s an understatement. Harm my computer. That’s just the start of the harm that comes from that website. But, I guess if I were an potential adoptive parent, I wouldn’t find it so harmful. Maybe might find it pretty helpful. Who knows. I am not an potential adoptive parent so I guess I will never know. I just found it funny from the perspective of a first mother who lost her oldest daughter to adoption. 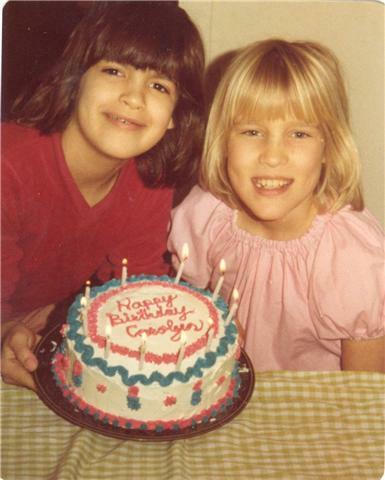 Today would have been my sister’s 39th birthday had she stuck around long enough here on earth. Unfortunately, when she was 18 years, 8 months and 23 days old she went through a windshield of a car and ended up on the other side of eternity. But you know what? I think that is exactly what she would have wanted her ending here to be like. She left this earthly life just as she lived it: a white-hot shooting star trailing spit-fire and sparks, hell bent on rocking the boat, challenging the status quo, and never ever taking the easy, quiet path. 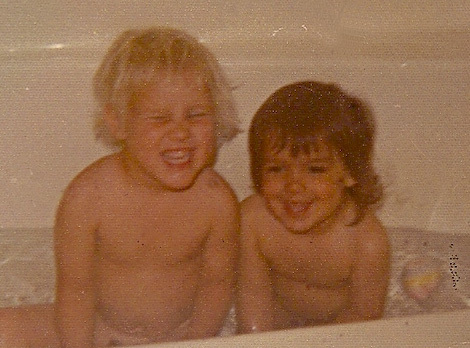 I was just 20 months younger than her and we grew up sharing bath time (that’s me on the right – I sure was cute, wasn’t I? ), bedrooms, toys, clothes, fights, and friends. As we got older, we continued to share our bedroom, clothes, fights, and friends, but upped the ante with cars, lockers at school, and jobs. When she died the Saturday before my senior year began…it was like losing a limb. I was exactly two months shy of turning 17 and I hardly knew how to function. 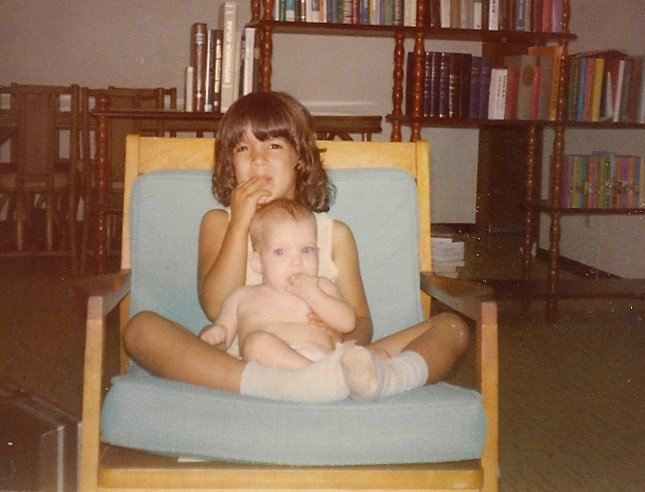 Living without her constant, daily big-sister presence in my life was like trying to learn how to walk again. She was quite the big sister to have and perfectly suited for the role. 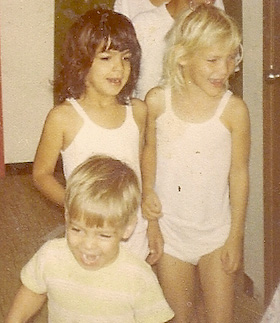 (That’s me and her in the picture above on Christmas morning 1977 when we were living on Guam.) There was something magical about her; everyone that met her adored her. She had a special tenderness for the elderly and was a fierce protector of the disabled. When she was angry, the gold flecks in her crystalline blue eyes would deepen to a dark amber. When she was happy, it was like basking in the warmth of a full sun in the spring. 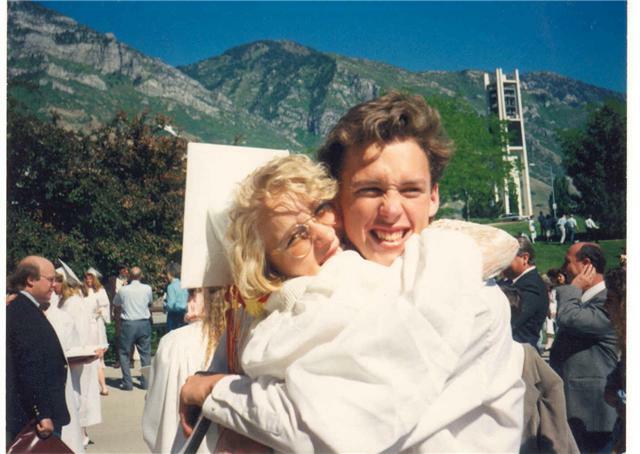 Speaking of the spring, whenever the snows there on the mountains in Utah Valley would finally start to melt, we would forge a note from our mom (sorry Mom) and skip school (sorry again Mom) so we could head for the foot hills. (That’s her at her high school graduation, exactly three months before she died in the car accident. If I could just pan to the left a bit in the photo, I could actually point out the spot on the mountain where we spent much of our school-skipping time). Finding our favorite secluded spot, we would shed our winter clothes for the swim suits underneath and climb up on the hood of the car and soak in the newness of the season. Those were good times. Good times indeed. She had an impish grin, cavernous dimples and a quick-silver temperament. Above all though, she loved each and every one of her siblings – all eleven of us – with a fierce loyalty that I have yet to ever find equaled in another person (that’s her above with Elly, baby #8). She was always our protector and our champion. 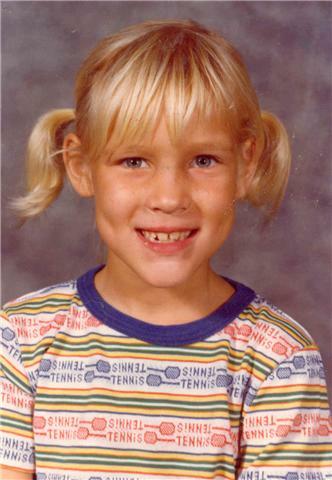 It wasn’t our big brothers who came to the rescue when the neighborhood bully would start picking on us – it was her. It was always her. Scrappy and bird-thin as she was, she always kicked the dog-snot out of anyone giving her siblings grief. She was the third of twelve children that came in quick succession and the oldest daughter. Watching out for us was a full-time gig. (That’s her and Angelyn, baby #9. My mom was raised Catholic and then joined the LDS church. There was never any hope that our family would be small.) Aside from keeping us from getting beat up by the meanies in the neighborhood, her chief role was to entertain and instigate. While I was the quiet, studious, obedient daughter, she was the one who was always finding new ways to make us laugh and more elaborate plans to get us into trouble with the parents. While I was the voice of caution and prudence, hers was the voice urging us to throw off the bow-lines and explore uncharted territory.